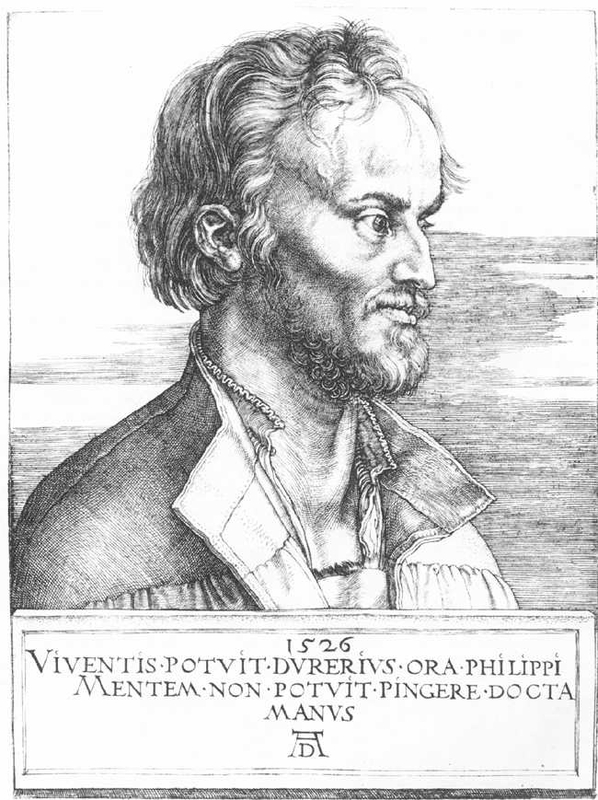 Durer’s Portrait of Philip Melanchthon, a well-known religious reformer and theologian, is notable for the manner in which the artist treats the eyes, each of which has something odd about it. 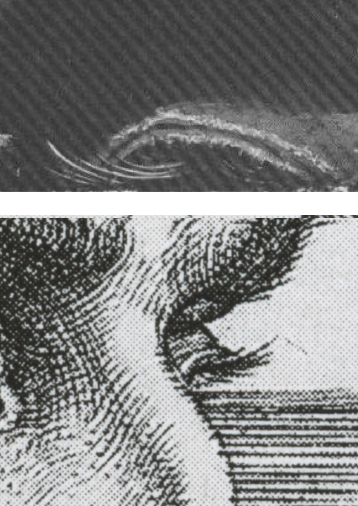 One eye is large, bright and clear; the other mostly unseen, the tip of its eyelash just visible above the clouds. This contrast between a large eye and an unseen one is made more mysterious by how the top-most cloud disappears behind the far eye, a juxtaposition between cloud and eye that is highly suggestive. It is as though the eyelash is actively drawing lines, a kind of optical burin. 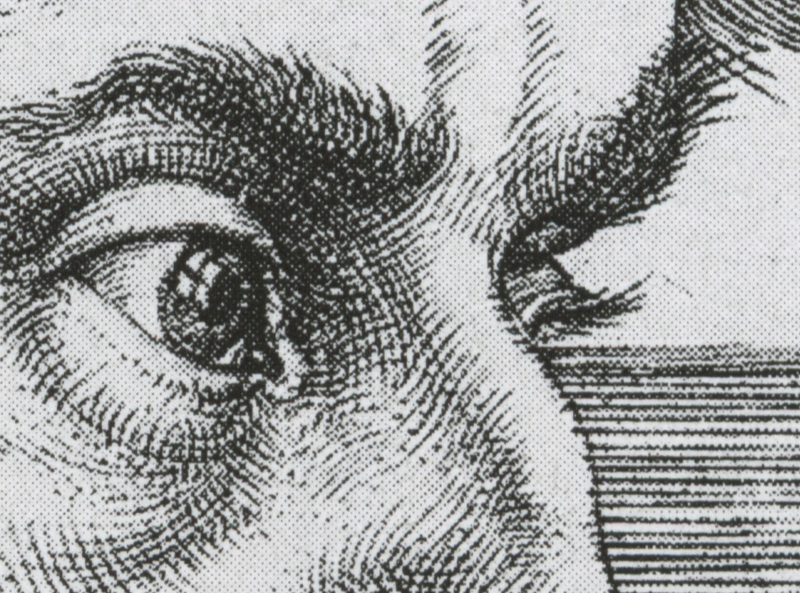 It is also tellingly similar to a small detail in Dürer's 1500 Self-portrait which Joseph Leo Koerner drew attention to (top)1. 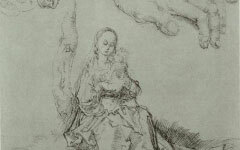 At the very lower edge where the image meets the frame some hairs of fur on Durer's sleeve peer like "eyelashes" from the bottom of the painting. 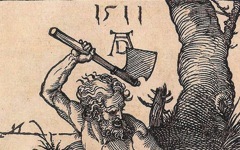 They are so close to the edge that they are often cropped in reproduction. 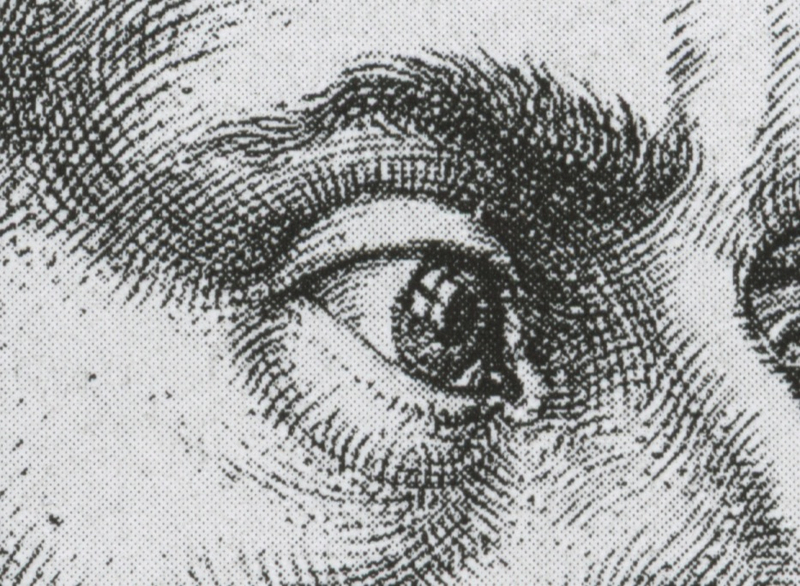 Koerner did not make the link between the sleeve and an eye but, to my mind, the sleeve in resembling eyelashes and the curve of an eye links Dürer's unseen hand with his eye just as the far eye in Melanchthon's portrait suggests a hand at work engraving the clouds. To make matters more complex, the reflection of a window in the near eye counters the figure’s supposed location “out-of-doors.” One nineteenth-century art historian complained that the presence of the window's reflection "verges on the ridiculous" as the clouds demonstrate that he is out of doors.2 It is always safer to assume, though, that our thinking is ridiculous, not the artist's. As so often in art, this portrait makes clear - to those willing to see - that it is not a record of reality like an early photograph. It does not depict the sitter in our illusory world and should not be thought of as such. 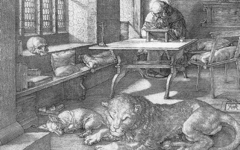 Dürer suggests that this theologian is a poet and his alter ego. His near eye looking inwards sees clearly, while the far eye looking outwards creates an illusion. Insight and out-sight are different forms of perception: a painter uses the latter alone, an artist both. Original Publication Date on EPPH: 02 Aug 2011. © Simon Abrahams. Articles on this site are the copyright of Simon Abrahams. To use copyrighted material in print or other media for purposes beyond 'fair use', you must obtain permission from the copyright owner. Websites may link to this page without permission (please do) but may not reproduce the material on their own site without crediting Simon Abrahams and EPPH.